"Worked Perfectly-Saved Weeks of Work"
The application worked perfectly-I didn't even need to read the instructions. In about 20 minutes I was able to import a full year of account info from 4 different accounts, into Quicken. Being able to work back and forth from Quicken to Excel was very useful in planing and integration to business processes. I'm entirely pleased. It does what it says it does, very well. I do not have any advice or suggestions for improvement. Try it for free. There's no risk and the pricing is great. The time saved pays for the software in a single use. I can't imagine anyone with the need to convert files would not be happy with this. Changing accounting software can be painful-this was not. "Problem with no good solutions"
It does what it says, within the limits of the Quicken product set. Primarily, it's that the product can't totally solve my problem because the Quicken feature set doesn't support it. I wanted to load historical 401(k) data, for a long-running account, to Quicken Mac. Not possible without using Quicken Windows; and then it required converting file formats; and a supporting bank. I had 10 years' CSV data downloaded from T. Rowe Price; had to convert to QIF for import to Quicken Windows; then try to export for Mac use. Finally failed importing to Mac. Carefully research what you need to do before the trial. A lot of Quicken scenarios simply aren't supported at time of data import. Personal finance. I didn't resolve my goals. I bought the product but no longer use it. "It saved me an incredible amount of time." Also, the tech support was very good. The interface is a little wonky. It could be designed better. Huge time saver. Make sure you map your CSV properly. Huge time saver. Allowed me to import data from bank and credit card downloads relatively easily. "Quick and easy solution to importing transactions into Quicken"
How simple it was without even knowing the program and it WORKED! Absolutely nothing. It was a client saving software purchase. I offer personal bookkeeping services for individuals desiring to keep better financial records. I prefer to download directly from banks. However, many clients do not want to allow online access to their bank. So I tell them to download in excel format and I will import into Quicken. If this software wasn't available, I'd have to enter transactions manually. UGH! The program is very easy to use on our computers, but it does lack options on conversion of dates. We found that date conversions didn't match the date layout selected. This is a particular problem in New Zealand where we traditionally use the date layout DD/MM/YYYY not MM/DD/YYYY. Apart from that the product seems to work very well, although we've only been using it for a short time. "Great product for those not wanting to use newer Quicken versions"
The product allows me to transfer a CSV from my bank into QIF so that I may import it into an older version of Quicken. I do not wish to upgrade to the newer Quicken because I feel my data is not secure and because I don't allows have internet access. It was not exactly intuitive figuring out how to use it, but once I got the preceedure down, it works beautifully every time. Not upgrading to online Quicken. 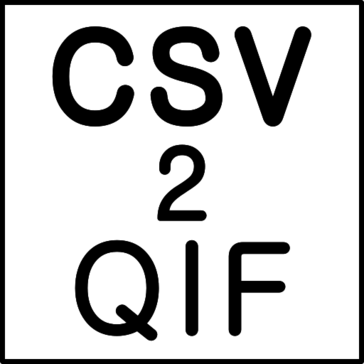 "Good program to convert information from csv to qif"
The ease of use once the parameters are set. This is a great product. Easy to use and learn. If you have certain formatted information, it inputs the data as you would expect. No extra information needs to be included from your financial institution. It allows me to convert financial information into quicken quickly and easily. "Still have not figured out how to map the software - and then save the map for future use." What it is supposed to do. But so far we haven't actually had that happen. It just works, simple to setup and run. perfect for my use. For my use there is nothing it cannot do. * We monitor all CSV2QIF (CSV to QIF Converter) reviews to prevent fraudulent reviews and keep review quality high. We do not post reviews by company employees or direct competitors. Validated reviews require the user to submit a screenshot of the product containing their user ID, in order to verify a user is an actual user of the product.